Rarely has a book touched me the way that How to Be Brave has. Louise Beech has written a debut novel that will live long in this reviewer’s memory and for those who have read it, for those who are going to read this and I urge you to do just that, your heart will be taken by the sheer natural brilliance of the writing. This is primarily part fact, part fiction and part memoir always a tricky one to get the right balance so that your reader follows each of the stories contained within the pages of the book, but here in How to Be Brave, the balance is remarkable. Natalie is married to Jake a serving soldier on a tour of duty in Afghanistan so the unbearable daily tension of a wife worried about her serving husband is real. Then one day her nine year old daughter Rose collapses at home and is rushed to hospital and is diagnosed with type 1 Diabetes and all the trauma for Natalie as she stays at her daughter’s bedside, Natalie is having to cope with all the worry of will Rose survive on her own as Jake cannot get home. The daily routine of blood sugar testing and injections of insulin are real at first Rose fights Natalie in the way a nine year old can. The pain and worry are there on the pages. Then one day Natalie is visited by man and one thing leads to another and a diary is found in their garden shed, no ordinary diary as Natalie had a grandfather (Colin) who tells the story through his diary of the sinking of his ship in the middle of the Atlantic Ocean. Natalie and Rose now embark on a voyage of discovery through Colin’s diary, while Natalie and Rose face their daily fight with Diabetes she reads passages of Colin’s diary as part of the process. What happens here is that unknown to them Colin is now holding their hands through the pain and suffering that Natalie and her daughter now face. Colin’s diary entries are real this is taken from the authors own real life relative and that of Colin trying to survive in a life boat with little in the way of rations and fresh drinking water how they all clung on to the daily hope that very soon they would be spotted and rescued through this story comes one of courage and hope, so both mother and daughter and Colin and his fellow survivors all trying to survive the stormy waters that they must tread in the hope they will come through. As this reviewer is discovering sometimes illness can be a very lonely existence and you can feel incredibly isolated when sometimes you do lose hope that you will come through this stormy period in your life. How to Be Brave is a story of just that. Hope and survival clinging to the lifeboat and hoping and believing that you come through. A deeply incredible book that will move you to tears so please have tissues to hand, you will need them. I have no shame in admitting that it did indeed move me to tears in parts. The front cover of the book is of a lifeboat cradled in the hands of both mother and daughter tell the story of hope and survival. A heart-warming story that uses a real life event to tell the story of an ‘against all the odds’ fight for survival. It is not very often that I get to the end of a book and felt completely numb at the sheer beauty of the author’s writing and storytelling. Hard to believe this is a debut novel. How to Be Brave a book I always remember and strongly recommend it will move you as it has already moved many. She loves all forms of writing. Her short stories have won the Glass Woman Prize, the Eric Hoffer Award for Prose, and the Aesthetica Creative Works competition, as well as shortlisting twice for the Bridport Prize and being published in a variety of UK magazines. Her first play, Afloat, was performed at Hull Truck Theatre in 2012. She also wrote a ten-year newspaper column for the Hull Daily Mail about being a parent, garnering love/hate criticism. She is inspired by life, history, survival and love, and always has a story in her head. Her debut novel, How to be Brave, came from truth – when Louise’s daughter got Type 1 Diabetes she helped her cope by sharing her grandad’s real life sea survival story. 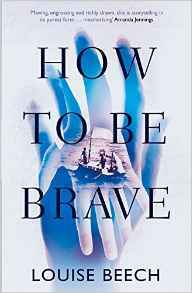 Posted on November 7, 2015, in How to Be Brave, Louise Beech, Orenda Books. Bookmark the permalink. 1 Comment. Definitely on my TBR list!